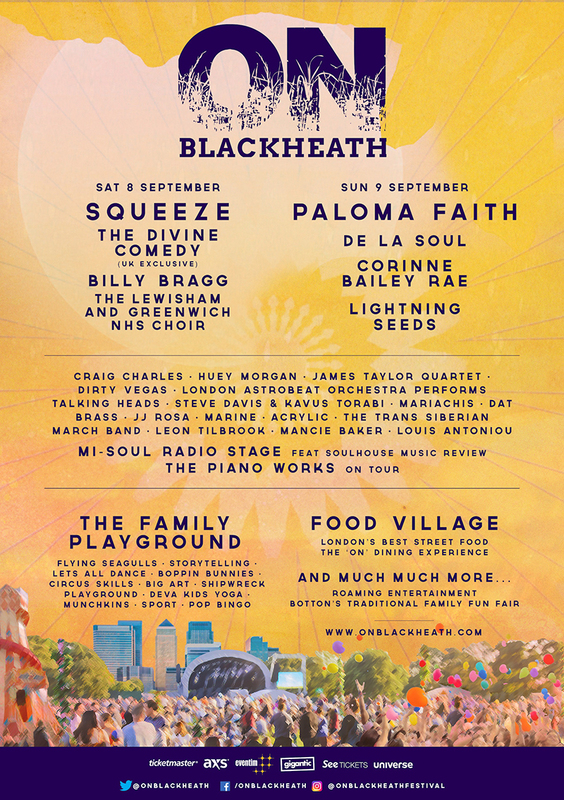 The two day music and food event will take place in the beautiful green spaces of Blackheath with a huge lineup of acts to enjoy. Headlining Squeeze (Saturday) and Paloma Faith (Sunday). Other Main Stage acts include The Divine Comeny, De la Soul, Billy Bragg, Corinne Bailey Rae, Lighting Seeds and the chart-topping Greenwich & Lewisham NHS Choir etc. On stage two, you’ll have Craig Charles Funk and Soul, Dirty Vegas, Norman Jay, Fun Lovin’ Criminals’ frontman Huey Morgan, and last year’s hugely popular and irresistibly catchy act, The Mariachis. As well as the music line-up, OnBlackheath offers a food experience for food lovers. From London’s own Street Food Union and a wide range of vegan meals and an all ages fun with ‘The Family Playground’, interactive fun, games, workshops, entertainment and activities for kids (and adults) of all ages at the festival. Some CBeebies stars will be appearing in the flesh a whole lot more.